The UN's nuclear watchdog has told the Security Council of the theft of nearly 350 metric tons of high explosives from a military complex in Iraq. The International Atomic Energy Agency (IAEA) said it was told by Iraqi authorities that the explosives were taken after last year's invasion. The Pentagon says that for the moment, is unable to account for the material missing from the al-Qaqaa site. Democrats have seized upon the incident in the run-up to the presidential vote. IAEA Director-General Mohamed ElBaradei passed on the letter from Iraqi authorities informing the agency of the theft to the Security Council. He told the council that the high explosives had been lost after 9 April 2003, during "the theft and looting of governmental installations". The IAEA was told about the loss over two weeks ago, Dr ElBaradei said, but he had hoped to give US forces and Iraqi officials time to try to recover the missing explosives before the matter became public knowledge. The explosives mostly consist of 195 metric tons of HMX and 141 metric tons of RDX - key components in plastic explosives, which have been widely used in car bombings in Iraq. The IAEA says the US-led coalition occupying Iraq had been warned about the danger posed by the explosives on several occasions. It says the coalition forces were specifically told to keep the material secured. Critics of the Bush administration have charged that too few troops were deployed in the invasion of Iraq to ensure sensitive sites received adequate protection. Democratic presidential contender John Kerry has accused US President George W Bush of committing "one of the greatest blunders" of his administration in failing to secure the material. "George W Bush, who talks tough - talks tough - and brags about making America safer has once again failed to deliver," he said while campaigning in New Hampshire. In Washington, White House spokesman Scott McClellan countered that "the first priority, from our standpoint, was to make sure that this wasn't a nuclear proliferation risk, which it is not. "These are conventional high explosives that we are talking about. And the president wants to make sure that we get to the bottom of this." Pentagon officials acknowledge that they cannot at the moment account for the material. They say the Iraq Survey Group, a US body which has been hunting for Iraqi weapons and programmes, is evaluating the situation. The officials add that they cannot verify if the explosives have been looted, and say one possible explanation is that the facility was empty before US-led forces arrived, reports the BBC's Nick Childs at the Pentagon. IAEA spokeswoman Melissa Fleming said the agency had not yet received any formal response from the US government. "It is certainly of concern to us that this kind of material that could have such a potential danger and be so devastating could have gone missing," she told the BBC's Newsnight programme. 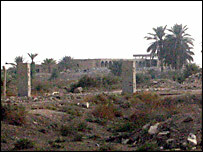 The IAEA last inspected the types and amounts of munitions available at al-Qaqaa in January 2003, at which point the HMX explosives had been sealed and tagged. The agency has not been allowed back into Iraq since the invasion. Half a kilogram (1lb) of a explosive related to HMX was enough to bring down Pan Am Flight 103 over Lockerbie, Scotland, in 1988, killing 170 people. The amounts apparently taken from the al-Qaqaa site could have filled three trucks. US weapons experts are concerned the explosives could be used in bomb attacks against US and Iraqi forces in the run-up to Iraq's planned elections in January. It is not the first warning the IAEA has given about potentially dangerous material going missing. Two weeks ago the IAEA warned equipment and materials that could be used to make nuclear weapons had disappeared in Iraq since the invasion.